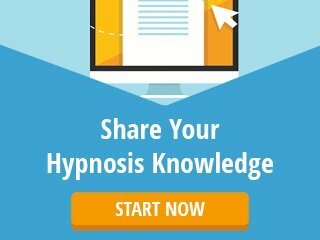 Want to discover everything master hypnotist Igor Ledochowski knows about hypnotic suggestions as well as 21 additional advanced hypnosis techniques? 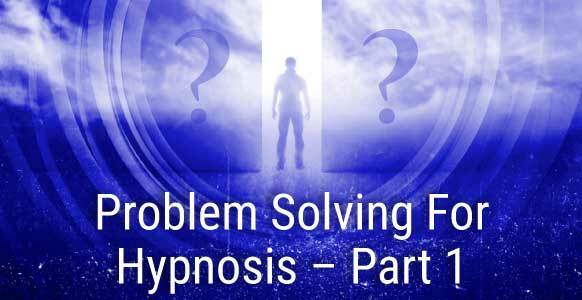 Check out this exciting collection of Advanced Hypnosis Masterclasses – they’ll answer every question you ever have when you get “stuck” doing hypnosis. If you’re a hypnotist, you’ll appreciate the power of words. They’re your stock in trade, whether you’ve been practicing hypnosis for a few months or for a couple of decades. This is because words are an essential part of your toolkit for creating powerful hypnotic suggestions so you can help people. And, what’s a hypnotic suggestion? 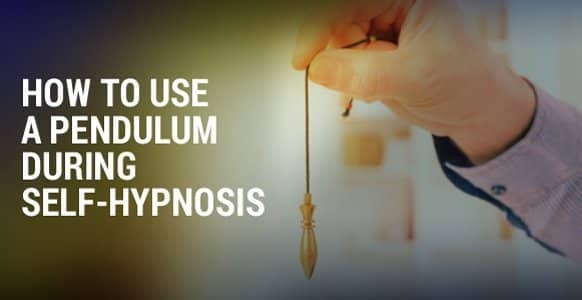 Just in case you’re new to the hypnosis world, a hypnotic suggestion is a directive given to a subject or client to do before, during or after trance. For example, during hypnosis, the suggestion may be to focus only on the hypnotist’s voice and go deeper into trance. Whereas a post-hypnotic suggestion (a directive to be carried out after trance), could be for the client to recall a disgusting taste in their mouth whenever they have the urge to smoke again. So as you can see, with the right words, you can “set the scene” for hypnosis and hypnotherapy to work more efficiently. And when you do that, you make it even easier for people to access inner resources, so they can overcome problems, be more positive, get motivated, kick bad habits or whatever it is they need to do. Just how powerful are the words you use? That’s the kind of effect the right words can have on people. They can make the things you say so irresistible that it’s almost like you’re casting a spell – even though the words you use are actually quite ordinary. But even the ordinary words you use every day have built-in transformational power. In fact, that’s where the idea behind “fridge magnet poetry” comes from. 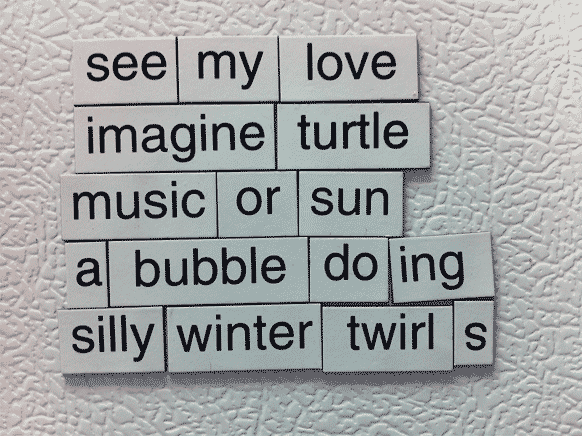 Poetic fridge magnets are simply words printed individually on magnetic strips. You’re free to place the words on the fridge in any order you like, even choosing words at random. Surprisingly, though, with just a little bit of fiddling the results can be quite deep and poetically pleasing. But why is that? How can you produce poetry by chucking a few magnetized words on an electrical appliance? Surely that goes against everything you hear from poets and songwriters. It’s supposed to be hard to write good verses, isn’t it? On one level, yes, it is. But on another level, the whole fridge magnet idea makes it easier. Why? Because your unconscious mind is freer to express itself. You might think you’re placing the words in a random order, but in actual fact your unconscious mind is helping you, guiding your hand. So as soon as you come up with a satisfying combination, you feel it. Your unconscious mind recognises the power of that particular phrase or sentence you created and transmits it to you, so you feel its impact. And just like that, you’ve got instant poetry. 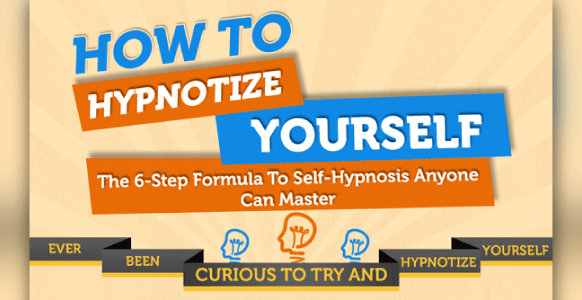 You can make use of this same concept to improve the power of your hypnotic suggestions. To do that, you need to take a closer look at what those fridge magnets contain. 1. Verbs – these are doing words, words of action, such as: run, jump, smile, talk, look, eat & sleep. 2. Adverbs – these are words that describe verbs, that “add” something to verbs, such as: quickly, slowly, happily, gently, carefully, joyfully. 3. Nouns – these are the words used to describe names, places and things, such as: Paul, cat, dog, London, house, bicycle, street. 4. Adjectives – these are words that describe a noun, or that “add” something to a noun, such as: big, grey, light, complex, fine, strong, sweet, cool, noisy. 5. Fillers – these are all the other words needed to make a sentence complete, such as: the, and, to, as, if, but, etc. Of course, fridge magnet words might not necessarily have anything to do with hypnosis or hypnotic processes. 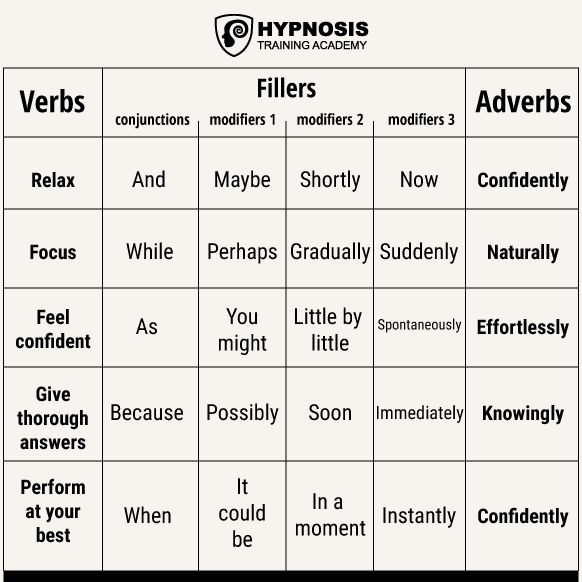 So you need to translate these 5 word types into the kinds of words you would use during hypnosis. The kinds of words that can help you create irresistible suggestions. 1. Verbs – these are the action words you use as part of your suggestions, which would probably include words like: relax, go into hypnosis, feel good, remember, forget, etc. 2. Adverbs – these are the presuppositions, distractions, and modifiers which include things like: suddenly, instantly, automatically, confidently, etc. 3. 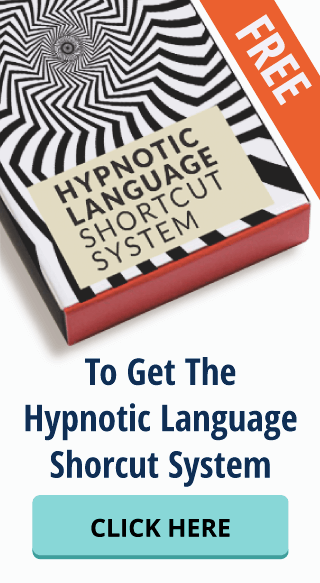 Nouns – these are the nominalizations used in your hypnotic pattern, which would include words like: happiness, resources, memories, understandings, etc. 4. Adjectives – these are the words that enhance the nouns; the qualifiers, distracters, and hyperboles that embellish the nominalisations, such as: amazing, awesome, powerful, exciting, etc. 5. 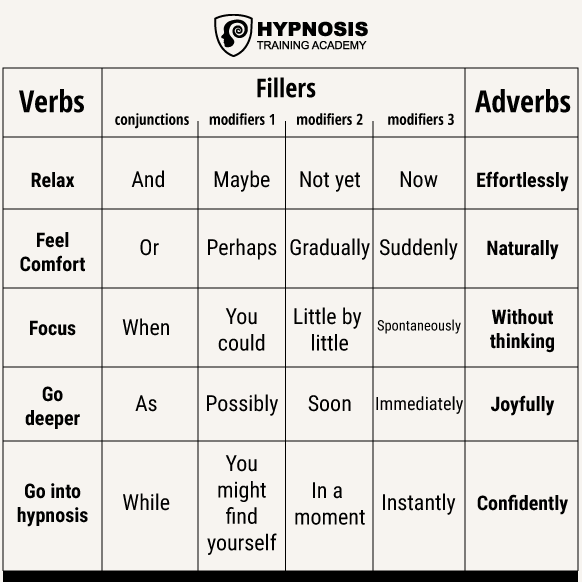 Fillers – these are the conjunctions and linguistic bridges needed to help your language flow smoothly from one hypnotic idea or theme to the next, including things like: and, if, as, when, while, because, etc. But how can you use that information to devise hypnotic suggestions? 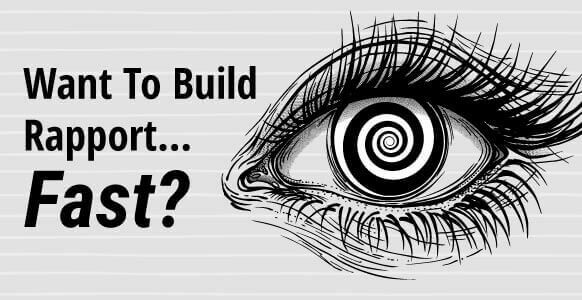 >>Want to discover everything master hypnotist Igor Ledochowski knows about hypnotic suggestions as well as 21 additional advanced hypnosis techniques? 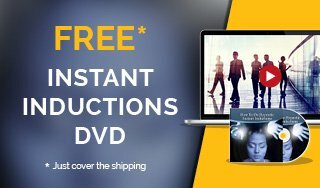 Check out this invaluable collection of Advanced Hypnosis Masterclasses – they’ll answer every question you ever have when you get “stuck” doing hypnosis. Just like you would do with the fridge magnets, the whole thing starts with a verb. Then you add fillers and modifiers in the form of conjunctions, linguistic bridges, modifiers, nouns, verbs, adverbs, and adjectives. And before you know it, you’ve got the equivalent of a hypnotic fridge magnet, but instead of poetry you end up with a solid and irresistible hypnotic suggestion. Adding the fillers, modifiers, etc. to the original action word is a process known as internal stacking. This is a way of making the same suggestion more complex and more expressive by adding words around it to give it depth and meaning. It’s easy to see how that works in the example above. Even with all the extra words used, the intention of the suggestion is exactly the same as it was with the single word. And that intention is: RELAX. By adding all the other words around it, you make it sound less like an order or a command. It flows smoothly from one word to another. And while an order or command might get someone’s back up, putting it in the form of a suggestion like this has the opposite effect. It makes your suggestion irresistible – or at least much more difficult to resist. 1. It misdirects attention – when you say “relax comfortably” you’re emphasising the idea of comfort. The other person’s thoughts will tend to focus on whether or not it IS comfortable, and they’ll tend to forget to think about whether or not they’re relaxing. 2. It overloads the conscious – the conscious mind can only handle between 7 and 9 bits of information at a time before it becomes too confusing. When your suggestion has 9 levels stacked inside it (as in the final line in the example above) it gets very tricky for the other person to keep track of everything that’s going on – which increases the chances that your suggestion can slip past the conscious mind and penetrate into the unconscious. 3. It creates the scene – this is called “semantic weaving” which refers to the use of language to create an atmosphere that feels relaxing or trance-like, or whatever else you want the atmosphere to be. One way to apply this internal stacking principle to your suggestions is to devise a list of words you might use. For example, here are 6 lists of words from just 3 of the categories mentioned above – verbs, adverbs and assorted fillers. As you can see, there’s nothing special about the words themselves. What makes them so potent is the way you combine them. That’s what gives your hypnotic suggestions their power and meaning. Of course, the type of suggestions you create will vary depending on the words you choose to populate your lists. You can also make lists with the words you use on a regular basis, and then challenge yourself to see how many new hypnotic suggestions you can come up with. When you make use of the internal stacking idea, it gives you the ability to tailor your suggestions for your clients’ specific problems. Take someone who needs a bit of a morale boost before they attend a job interview, for instance. You could simply make your lists with that situation in mind. You’ll notice that these are all representative of action words or verbs (relax, perform, focus, etc.) They could go in your first column. Then what? Next you’ll probably move on to fillers. If you use the table above as a model, then each of your filler columns will have its own specific purpose: one for conjunctions, one for modifiers of potential (maybe, perhaps, etc. ), one for modifiers of eventuality (soon, in a moment, etc. ), and one for modifiers of time (suddenly, now, etc.). You’ll also want to include some adverbs to help with the morale building side of things, such as confidently, easily, professionally, etc. These could go in your final column. Here’s an example of how a table aimed at morale boosting for someone attending a job interview might look, using the relevant words and categories. You can see that once you’ve got everything written down in black and white, it’s easy to construct suggestions, because all of the raw material is right there in front of you. And although this example uses only 5 verbs, 5 adverbs, etc., you can add as many words or phrases to the columns of your list as you think appropriate for the issue you’re dealing with. This example avoids the use of nouns, and it doesn’t include adjectives at all. This is done purposely just to make things easier and to get the ball rolling. You’ll find out more about how to apply these two particular word types in Part 2 of this article. 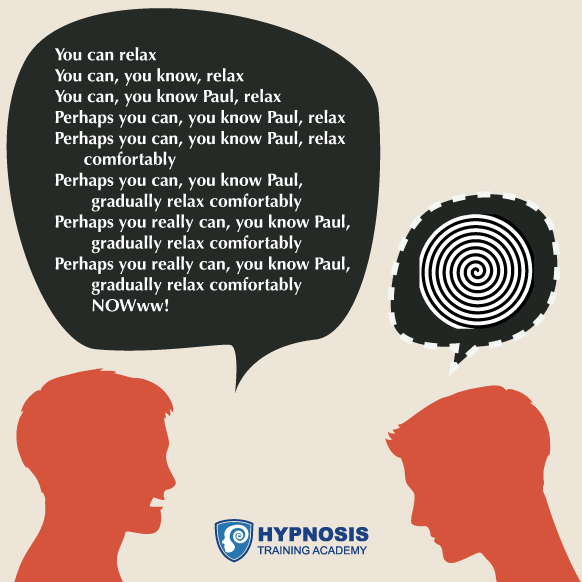 You’ll discover the two different types of nouns that are particularly useful in hypnosis. You’ll also get information on the use of hot words, referential index, and fascinating phenomenon known as unconscious priming. In the meantime, why not try to create the most irresistible hypnotic suggestions you can using the table above? 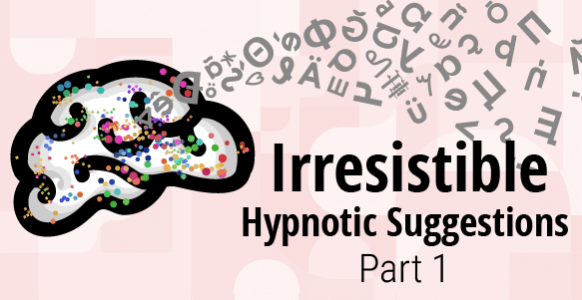 >>Want to discover how you can make your hypnotic suggestions even more irresistible, as well as other “insider techniques” such as hypnosis profiling, how to exploit pseudo logic and hypnotic power loops? 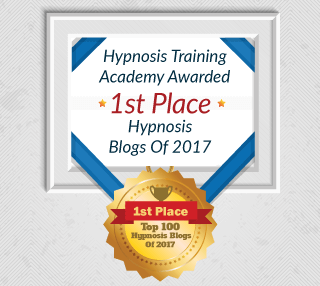 Check out Igor’s invaluable collection of Advanced Hypnosis Masterclasses to discover these and much more.